Lascar data loggers are offered by DATAQ Instruments because their low price points and narrowly defined measurements round out our own line of data logger products. DATAQ Instruments is one of the largest and most successful resellers of Lascar data loggers in the US market due to our market breadth and online presence, and we offer the most comprehensive datasheets, multimedia, and articles available on the Internet for Lascar products. Our dedicated staff is committed to providing the best and pre-and post-sale technical support available. And to top it off, we also offer a 10% discount on EVERY Lascar Data Logger. Just use code EL10USB at checkout and the price will be reflected in your order. Please call for quantity discounts. 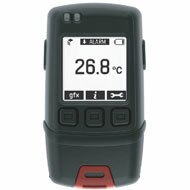 DATAQ Instruments is proud to carry the full line of Lascar Data Loggers for sale on our web site. Each Lascar data logger provides a specific measurement function and range and provides built-in memory (except the EL-USB-RT) for data storage and complete stand-alone operation. There are four groups in the Lascar data logger line. The EL-USB Data Loggers are the lowest cost and require a USB connection to a Windows PC (or the EL-DataPad) to configure the logger and upload and review logged data. The EL-WiFi series provides wireless communications and seamless data transfer to your PC. 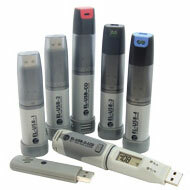 The EL-GFX series is similar to the EL-USB series but also provides a graphical display of acquired data. Finally, the EL-EnviroPad product offers a complete stand-alone solution for recording thermocouple-based measurements, and offers the flexibility to connect to any operating system that supports a USB thumb drive. Why Buy from DATAQ Instruments? DATAQ Instruments offers the most comprehensive and complete datasheets, multimedia, and articles available on the internet for Lascar products. Our dedicated staff is committed to providing the best technical and pre-sales support available. And to top it off, we also offer a 10% discount on EVERY Lascar Data Logger. Just use code EL10USB at checkout and the price will be reflected in your order. Please call for quantity discounts. Lascar EasyLog model EL-USB series products are a line of low cost, compact, battery-operated data loggers with built-in memory and a USB interface for easy setup and data download. Each product in the line offers a specific measurement function (including temperature, voltage, process current, and more). Built-in USB interface for easy setup using any PC (or use the EL-DataPad). Learn More about Lascar EL-USB Data Loggers. Lascar's EL-Wifi Data Logger series products are low cost, compact, battery-operated data loggers with wireless connectivity to any PC over a WiFi router. Each product in the line features a large, easy-to-read display of current measurements, and is purchased for specific measurement functions. Wireless communication to any PC using WiFi. Seamlessly uploads memory to host PC at programmable intervals. Built-in display shows current, min/max readings, alarm states. Built-in USB interface for battery charging and initial configuration. Hardened plastic bracket for easy deployment. 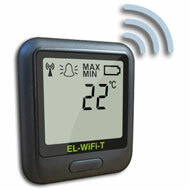 Learn More about Lascar EL-WiFi Data Loggers. EL-MOTE products are simple to set-up and easy to use. Download the EasyLog Cloud App and configure your device in minutes over a WiFi network. 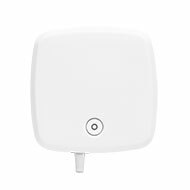 The EL-MOTE can be placed anywhere within range of your wireless router of WiFi enabled PC to continuously monitor and record data to the EasyLog Cloud. You can access your data using a web browser (Internet Explorer, Chrome, etc.) 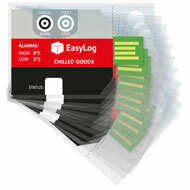 or using the EasyLog Cloud App on your Apple or Android device. The EL-MOTE can be programmed with high and low temperature alarm zones. If a threshold is breached, an alarm will be activated. Alarm options include email alerts (which can be sent to multiple email addresses), an audible tone or a flashing LED alert. EL-MOTE devices can be powered using the four 1.5V AA batteries (supplied) or an optional AC adaptor (sold separately). A mountable wall bracket is included for easy installation. Learn More about Lascar EL-MOTE Data Loggers. The EL-GFX line of data loggers is the latest release from Lascar Electronics with similar functionality of the EL-USB series with an added graphic display for data. Learn More about Lascar EL-GFX Data Loggers. 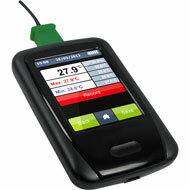 Lascar's EL-EnviroPad-TC is a touch-screen device used to measure and record thermocouple temperature readings. It looks and behaves like a thumb drive when connected to a PC and transfers a delimited ASCII file containing recorded data, so it is compatible with all PCs and operating systems. Learn more about the EL-EnviroPad-TC. 21 Code of Federal Regulations Part 11 (21CFR Part 11) has been established by the Food and Drug Administration (FDA) to govern the veracity of electronic records and signatures. Through a defined system of checks and balances 21CFR Part 11 ensures that information applied to the standard is both traceable and unalterable. That information could be temperature, humidity, and time and date. Through a unique combination of data logger firmware and PC-side or cloud-based software these instruments ensure 21CFR conformance, which allows it to be deployed in applications that demand it: Medical device manufacturing, pharmaceuticals, contact research organizations, and others where hardcopy paper records have been displaced by computer files. 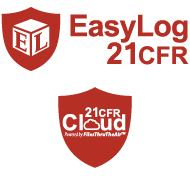 Learn more about EL-21CFR Data Loggers. 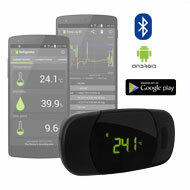 Model EL-BT-2 Bluetooth-enabled temperature and humidity data logger fills the convenience gap between stand-alone USB and WiFi data loggers. It maintains the simplicity of the manual USB approach while providing many of the automated benefits of WiFi without the IT network deployment hassles. The Bluetooth interface provides a handy approach to instantly configure and retrieve data from the logger using a smart device while in the logger's proximity (up to around 30 feet.) A free Android™ app installed on a compatible smart device provides all the software you need to detect, configure, and archive data from one or more EL-BT-2 instruments. Model EL-BT-2 also has a built-in display and a front-panel control button that gives you a handle on operation and performance without a Bluetooth device. Pressing the control button activates the display. Successive depressions cycle between real time and minimum and maximum recorded temperature and RH values. Bluetooth connection and battery charge status are also shown. Finally, a red and green LED shows alarm and recording states at a glance. The EL-BT-2's internal battery delivers up to six months of operation on a single charge, and can be recharged. Learn more about the EL-BT-2. Learn more about the EL-CC-1. Simplicity, accuracy, and confidence define the EL-CC-2 Data Logger approach to ensure that food stuffs of any type were not exposed to dangerous temperature extremes during transit and handling. 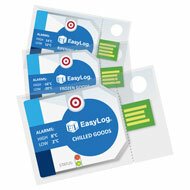 Packaged in their own hermetically sealed bag, EL-CC-2 data loggers are offered as three individual models, each enabled for relative humidity measurements configured to alarm at a specific temperature range: one model each for frozen, chilled, and ripening food stuffs. The data loggers can be initiated on-the-spot and placed into service without the need for configuration software. A preprogrammed 30-minute delay prevents alarms from triggering until the logger is fully saturated in the ambient temperature it's monitoring. The logger samples at a fixed rate of one sample every 10 minutes, and contains enough memory to provide over 220 days of total record time. If pre-programmed temperature extremes were breached, the LEDs provides an instant visual indication of the problem without the need to download and review recorded data. After deployment the logger may be connected to the USB port of a PC to upload all recorded temperature, humidity, and event data, each correlated with a specific date and time of acquisition. Data can be sent to a PDF, Excel, or JPEG image file. Software is downloadable and provided at no extra charge. The life of the EL-CC-2's built-in battery exceeds the instrument's >220-day total record time. Learn more about the EL-CC-2. EL-PDF-1 data loggers can be initiated on-the-spot and are supplied ready-to-operate: A built-in temperature sensor, no battery to install and no software to ever download and run. Simply press and hold the START button until the STATUS LED shows green, deploy the logger in the environment you want to monitor, and walk away. It's that easy. A pre-programmed 30-minute delay prevents alarms from triggering until the logger is fully saturated in the ambient temperature it's monitoring. The logger samples at a fixed rate of one sample every 10 minutes, and contains enough memory to provide over 220 days of total record time. At any time during the recording process the logger's STATUS button can be pressed to activate built-in LEDs. That action saves a marker in the recorded data stream to indicate the event. At the same time the LEDs illuminate to indicate device status and alarm states. If pre-programmed temperature extremes were breached, the LEDs provides an instant visual indication while the logger continues to record. After deployment the logger's integral plastic bag is opened to expose its USB port. Connect the logger to any computer running any operating system and the logger appears as a USB drive containing a PDF report file. Simply move the report to your computer to review and disseminate as you would any file. Afterward, re-deploy the data logger for other recording sessions again and again over the logger's estimated 220-day life. The optional EL-CC-BAG is available to maintain the instrument's IP67 rating after its first use. No software to install. The instrument is completely self-contained. Learn more about the EL-PDF-1.